Nowadays a send only mailbox usually occurs in Exchange. This can be Exchange Online (Office 365), but also Exchange On-Premise. The first method is about creating a Send Only Mailbox in Exchange. It’s also possible that you’re using other mail applications such as Google Apps. Unfortunately my knowledge does not extend so far to know if you can create rules within the G Suite Admin Console. 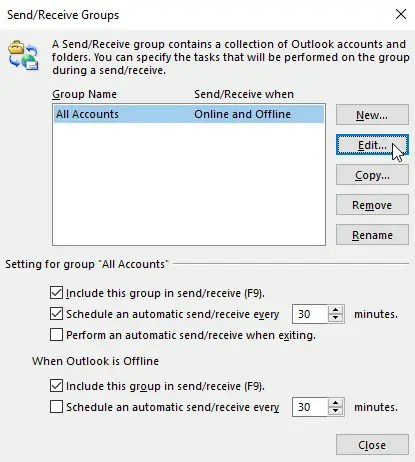 The second method is about configuring a Send Only Mailbox in Outlook itself. A send-only mailbox can be useful if you want multiple users to work from one address that only send mails. This can for example be a no-reply address. In method 1 I explain how you can create a send only mailbox. Most users will call this a no-reply mailbox or something similar. I assume that you are an IT engineer and therefore already know how to get to the rules within the Exchange platform. Create the mailbox in the regular way. Go to Exchange and open the rules. You can open this link for Exchange Online. Here we can choose what we want to do with the received mail. If it is a no-reply email you could send back an answer that it is an unread mailbox or something similar. I choose delete the message without notifying anyone. Use the default settings for the rest. 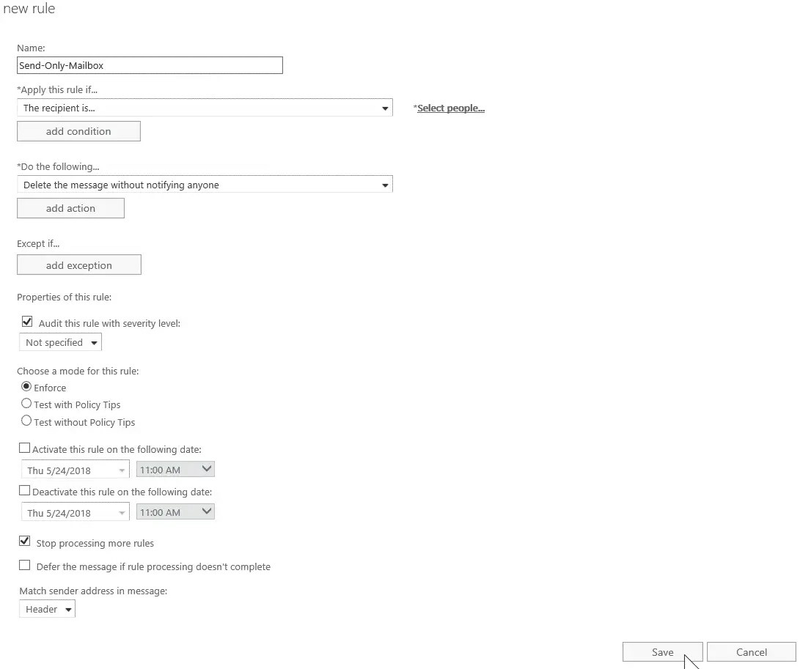 Now all you have to do is give users permissions to the mailbox and open them in Outlook or OWA. From now on users can only send e-mails and no longer receive them. For these mailboxes it is useful to add an extra disclaimer so that the recipient knows that this is a no-reply address. 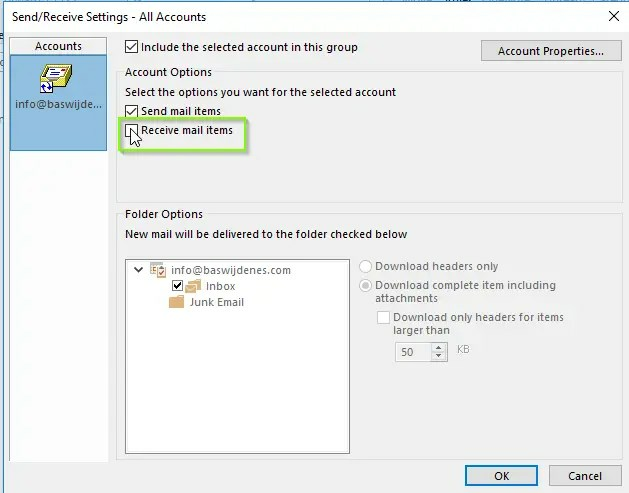 If you use a different mail application than Exchange, for example G-Suite or use a mailbox in cPanel or something similar, you can also configure a send only mailbox directly in Outlook. The steps that we configure here are unfortunately adaptable unless you implement this via a Group Policy. I have not done this myself before through a Group Policy. Go to Control Panel and search for Mail. Fill in an incorrect incoming mail server. 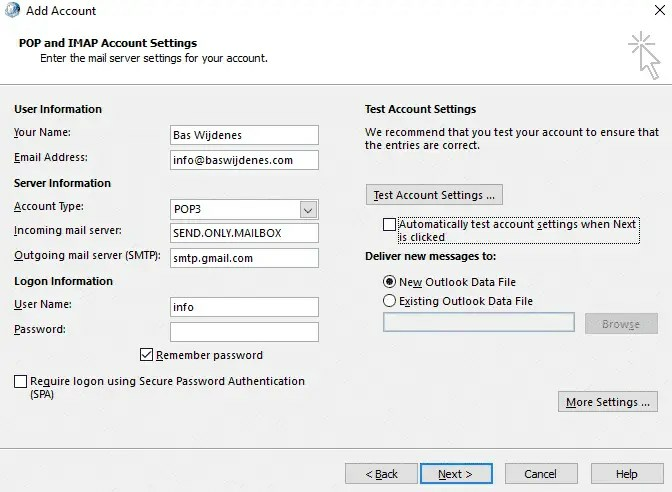 Use the correct Outgoing mail server (SMTP). As an example, for gmail it’s smtp.gmail.com.